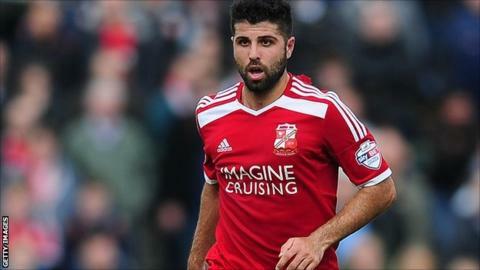 Swindon Town midfielder Yaser Kasim says the change of manager at the County Ground has given him a boost. Mark Cooper was sacked on Saturday after more than two years in charge and having guided the Robins to the play-offs last season. Chairman Lee Power has taken temporary charge with Swindon lying 23rd in League One and winless in nine games. "It gives me a lift as I am going to go back to a way of playing that I love," the 24-year-old told BBC Wiltshire. "We lost our way the past couple of months the way we played," the Iraq international added. "Some of the players are looking forward to coming back from injury and playing some good football. "It was tough knowing we built something the past couple of years which I believed was good and these last couple of months we left that path. Leaving that path was difficult." Kasim also said their poor form which has seen them drop into the relegation zone had taken its toll. "Football is a lot of mental strength, it is a job I love and my ambition is to go all the way to the top but you have to understand there are mental challenges," he said. "When you work with people you have to adhere to other people and other people have their own energy and thoughts. You can't control the people around you, only yourself, so within that you have to have a lot of mental strength. "You come in and want to have fun but if the atmosphere is not fun it is tough. Sometimes you have to accept it for what it is until you come out of the other side."